Purina Premium Game bird Block is a highly-palatable, easy-to-use 20-pound premium block supplement for attracting and maintaining pheasant, quail and other game birds. Now containing the new Purina® Power Nugget™ supplement, new Purina® Premium Game Bird Block provides more complete nutrition for game birds than whole grains. New and improved Purina® Premium Game Bird Block is designed to be fed year-round to supplement natural diets. Place blocks on the ground within the normal range of game birds. Designed to support game birds and help regulate their consumption of Purina® Premium Game Bird Block according to the availability of natural diet. Not a complete feed. Do not place block on grass or lawn. Block may kill grass before it is completely consumed. Regulations for the feeding of game animals vary from state to state. Check with your State Game and Fish Department or the Department of Natural Resources for guidelines on the proper use of this product. A feeding program is only as effective as the management practices. Actual results can vary depending upon feed intake,environmental conditions and the quality of the management practices. 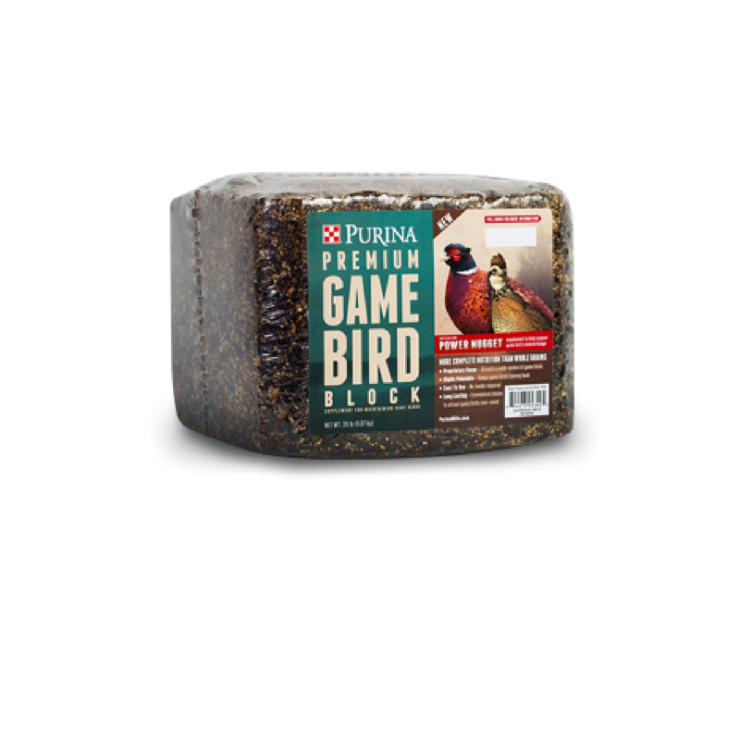 New and improved Purina® Premium Game Bird Block is designed to be fed year-round to supplement natural diets. Place blocks on the ground within the normal range of game birds. Designed to support game birds and help regulate their consumption of Purina® Premium Game Bird Block according to the availability of natural diet. Not a complete feed. Do not place block on grass or lawn. Block may kill grass before it is completely consumed. Store in a dry, well-ventilated area protected from rodents and insects. Do not feed moldy or insect-infested feed to animals as it may cause illness, performance loss or death.